Serves 4-6 (makes 2 strudels). Preheat the oven to 200C/400F/Gas 6. Mix the pineapple, pears and mincemeat together in a mixing bowl. Take 3 sheets of filo pastry at a time. Melt the butter or vegan margarine*. Brush one sheet of filo pastry with melted fat, place another sheet on top, brush again and top with the final sheet. Spoon half the filling onto the pastry along one long edge about 2.5cm/1″ in. Roll the filling up in the pastry tucking the ends in as you go. 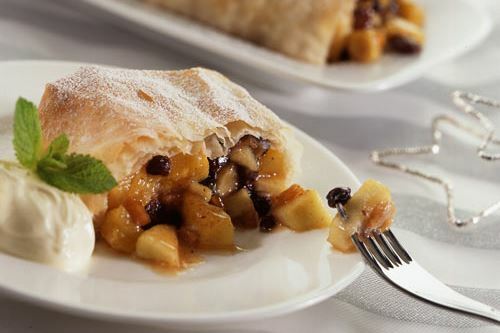 Place the strudel onto a greased baking sheet. Repeat with the remaining filo pastry and filling. Brush the outside of the pastry with melted fat and bake in the preheated oven for about 15-20 minutes until golden and cooked. Place on a serving dish and dredge with icing sugar. Serve with crème fraiche or soya cream. #If you are cooking for a vegan, check the mincemeat ingredients as some varieties include dairy products or honey.